"Our building's pretty wild. A 3 o'clock game, I know that people are going to be ready for sure," Shayne Gotisbehere told the Courier-Post before referencing the recent success of the Eagles and Villanova. "Especially with what this city's seen in the past couple months, I know they're going to be ready." 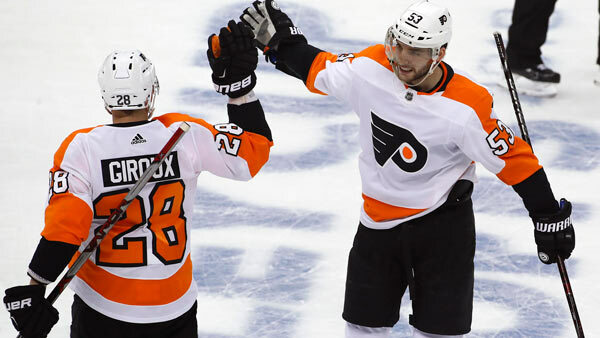 Though the Flyers benefited from some lucky bounces, the win wasn't supernatural as much as the result of better defense, stronger goaltending and success on special teams. "Said it coming in, nobody really is giving us a serious chance in this series," Flyers coach Dave Hakstol told NHL.com after the game. "I don't know if anybody still will. But I know this; we just got it down to a five-game series and we introduced ourselves into this series tonight." Gotisbehere's first-period goal ended Matt Murray's incredible playoff shutout streak at 225 minutes, 49 seconds dating to last season. "We always thought we had a realistic shot," Gotisbehere told the Courier Post of the series. "You want to win every game, obviously. We knew what we had to do. The first game is in the past just like this game is in the past. We're going to reset here and be ready for Game 3." Penguins stars Murray and Sidney Crosby weren't bad in Game 3, they were just human, words not usually associated with them in the postseason. Crosby had a hat trick in Game 1, but Elliott stopped him on a breakaway in Game 2 when the score was 2-0 and Crosby later failed to convert a perfect feed from Phil Kessel as the second period was expiring, but missed an empty net before smashing his stick over the crossbar. "If I find a way to put that in, it's 2-1, it's a different game," Crosby told the Pittsburgh Post-Gazette. "That one and the breakaway was a big turning point in the game." Instead, the Flyers led 4-0 before Patric Hornqvist's goal at 5:47 of the third period. If Philadelphia can jump out early Sunday and increase the Penguins' frustration level, they can maintain their momentum. The Flyers got more good news Saturday, when they learned Claude Giroux won't have a disciplinary hearing for his hit on Kris Letang during the second period Friday night. After Crosby and Giroux collided, Giroux went backward into Letang, appearing to elbow him in the face. For the two-time defending Stanley Cup champions, this was their first loss in six games against the Flyers this season. "We know this is going to be a hard-fought series. It's everything we expected it to be," Penguins coach Mike Sullivan told the Pittsburgh Post-Gazette. "We're going to have to go to Philly, and we're going to have to find a way to win games."